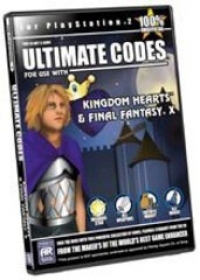 Box Text: Ultimate Codes gives you the power to unlock Kingdom Hearts and Final Fantasy X biggest secrets. Kingdom Hearts and Final Fantasy X are extremely detailed games that are simply loaded with cool things to do. Ultimate Codes helps you access all areas, so you won't miss a thing! Using Ultimate Codes you can activate powerful, totally unauthorized codes so you can do things that even the game's programmers never anticipated. Become a Kingdom Hearts and Final Fantasy X Master with Ultimate Codes! 07-18-2014 htimreimer Box Text Ultimate Codes gives you the power to unlock Kingdom Hearts and Final Fantasy X biggest secrets. Kingdom Hearts and Final Fantasy X are extremely detailed games that are simply loaded with cool things to do. Ultimate Codes helps you access all areas, so you won't miss a thing! Using Ultimate Codes you can activate powerful, totally unauthorized codes so you can do things that even the game's programmers never anticipated. Become a Kingdom Hearts and Final Fantasy X Master with Ultimate Codes! This is a list of VGCollect users who have Action Replay Ultimate Codes - Kingdom Hearts & Final Fantasy X in their Collection. This is a list of VGCollect users who have Action Replay Ultimate Codes - Kingdom Hearts & Final Fantasy X in their Sell List. This is a list of VGCollect users who have Action Replay Ultimate Codes - Kingdom Hearts & Final Fantasy X in their Wish List.